This has been a problematic fixture in recent years for Sevilla, with Levante one of the few teams to boast a decent record when it comes to getting results at the Ramon Sanchez PIzjuan. The hosts will be firm favourites again this Saturday and Sevilla could do with the win, with other sides putting pressure on them for that vital 4th place in La Liga. This game also comes sandwiched in between two legs of their Copa del Rey Quarter-Final with Barcelona. Sevilla won the 1st Leg 2-0 so there may be some temptation to rest legs for the decisive 2nd Leg at Camp Nou when the Catalans are sure to put them under lots of pressure. 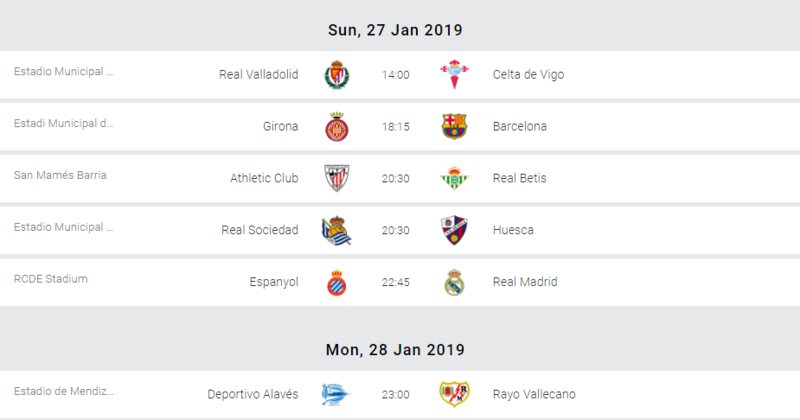 However with just 2 points from their last 4 league games, there is also a genuine need to try and get a first win of 2019 in La Liga. Levante will be out for revenge after a 6-2 home defeat to Sevilla earlier in the season. This however is likely to be a very different game. Away from home, Levante have tended to defend very deep and play on the break, which has brought them a fair bit of success, with impressive away wins at Betis and Real Madrid already this term. That will certainly serve as warning to Sevilla. The bookies seem to be expecting another high-scoring contest but there is reason to doubt that. Sevilla have looked tired at times over the past month and haven’t been operating or attacking with their usual intensity. That has contributed to all of their last 8 games in La Liga producing under 2.5 goals, while all of their last 11 have produced under 3.5. This Saturday sees Getafe travel across Madrid to take on Atletico, with perhaps more hope than they have done in recent years. They have a shocking record against their city rivals but come into this match in fine form and starting to mount a serious challenge in league and cup. They could even move into the top four of La Liga this weekend with victory here and a couple of favours elsewhere. That’s unlikely but Getafe ought not to be short on confidence. They’ve lost just 1 of their last 12 in all competitions and haven’t lost away in La Liga since the opening day. They moved into real top four contention with an impressive 4-0 win over Alaves last weekend and have since moved to the brink of the last four in the Copa del Rey with a 1-0 win over Valencia in their Quarter-Final 1st Leg in midweek. Atletico Madrid are already out of that competition and look about the only side that is now capable of truly pushing Barcelona in La Liga. They’d briefly at least narrow the gap to two points with victory here and they are fresh from one of their most convincing league displays this term, a 3-0 win at Huesca last weekend. While Getafe haven’t lost on the road since August, that record will come under serious threat here. Atleti should be the fresher of the sides having not played in midweek and history is certainly on their side when it comes to this fixture. The last 12 league clashes between this pair have produced 11 Atletico wins and incredibly not a single Getafe goal. They have also had a tendency of coming unstuck against the bigger teams this term. They’ve only lost 5 games in La Liga but all of last season’s top four has beaten them, with Jose Bordalas’ men scoring just once in those fixtures. Atletico will feel they are well equipped to deal with the threat of target-man Jorge Molina and they will fancy they have enough quality at the other end to seal the three points. This Saturday’s clash between Leganes and Eibar may not exactly be the glamour fixture this weekend in La Liga but it’s a big one for both clubs, with the duo trying to avoid being sucked into the thick of the relegation battle. Three points would see Lega move level on points with Eibar in that particular battle. Leganes come into this game following a 3-1 defeat at Camp Nou in a match that was clouded in controversy, when the visitors furious Luis Suarez’s decisive goal was allowed to stand. They’ll be pretty glad to get back on home soil here though with Butarque having been something of a fortress for them this term with just one defeat there all season. Eibar meanwhile come into this game in much better spirits after they eased past Espanyol 3-0 on Monday night. It was their first win since that famous victory over Real Madrid so it was certainly an overdue success but they will be hungry to improve on an away record of just one victory so far in the 2018/19 season. Leganes are slight favourites here and that’s probably about right. Their key striker Guido Carrillo is a major doubt and he has been central to their direct approach this term with almost all of their attacks going through the former Southampton man. New signing Martin Braithwaite has been lively, scoring against both Barcelona and Real Madrid already but he is likely to get less space to run into here against a more defensive side like Eibar, which may make it tougher for him to have a big role in the game. Leganes may only have lost once at home but there have been plenty of draws. 44% of their home league games this term have finished level in fact with 3 of their last 5 at Butarque ending with 1-1 scorelines. Eibar have also developed a reputation for drawing rather than winning games of late. They drew 5 straight matches between December and early January, with that sequence only broken by a defeat at Camp Nou followed by that victory over a weakened Espanyol side. This is one of the standout fixtures this weekend in La Liga as local rivals Valencia and Villarreal meet at the Mestalla. Both sides are trying to turn their seasons around after disappointing openings to the campaign. This fixture has favoured the Yellow Submarine in recent years but they find themselves in deep trouble heading into this Saturday’s clash. Villarreal are currently down in 19th and without a league win since late November. Despite a side that still possesses plenty of quality, particularly in midfield, they’ve been leaking goals and were perhaps a bit fortunate to scrape a draw at home to Athletic Bilbao last weekend. New boss Luis Garcia is yet to record a league win in 5 attempts since replacing Javi Calleja. Valencia haven’t made a coaching switch yet this term but if rumours are to be believed, they’ve come very close. Marcelino, who faces his former club here, has managed to get results just when his fate looked all but sealed, the most recent of which was an impressive 2-1 comeback win at Celta Vigo last time out. That win propelled Los Che into the top half but they have since lost in the Copa del Rey at Getafe. Valencia are clear favourites here but it’s hard to see the value in them at anything shorter than Evens here for a number of reasons. One is their poor record in this fixture with just 1 win from their last 8 matches against their regional rivals in the Valencian Community. Secondly, Valencia have only recorded two home wins all season in La Liga, both of which came against sides in the bottom three. Villarreal may also currently be in the drop-zone but few can doubt that they have the quality needed to eventually pull away from trouble. Villarreal’s away record is also not as bad as their league position suggests. They’ve avoided defeat in 67% of their road games in La Liga this term and with happy recent memories of trips to the Mestalla. This Sunday’s clash between Real Valladolid and Celta Vigo in La Liga suddenly has the feel of a genuine relegation six-pointer as both sides continue to slide down the table into the thick of the relegation scrap. Heading into match-day 21, they are the two teams directly above the drop-zone and defeat for either here would be a bitter blow. Celta Vigo’s form can pretty clearly be linked to the absence of Iago Aspas. Their top scorer and attacking talisman is yet to make an appearance in 2019 due to injury. Without him, Celta have lost all their matches and are now seeking to end a four game losing streak with Aspas again a major doubt for the game. The pressure is certainly building on Miguel Cardoso whose side has looked very disorganised of late. It would be a bit harsh to say that about Valladolid but a lack of quality is a more pressing concern. They could probably do with some January recruits having gone 7 without a win in all competitions heading into this match. They felt somewhat hard-done by last weekend with a VAR call denying them an equaliser in a match at Levante, which they went on to lose. The sides shared 6 goals earlier in the season and right now Celta Vigo look very poor defensively. They’ve conceded twice or more in all of their last 4 games. You have to go back to last January for their last away clean sheet in any competition with all of their last 7 road games seeing them let in at least two goals. 89% of Celta’s away league games this term have seen both teams score. Valladolid matches haven’t been anywhere near as entertaining but despite that 7 of their last 10 in all competitions have still seen both teams find the net. This Sunday’s Catalan derby in La Liga has been one of the most talked about fixtures in the Spanish top flight this season. Originally it was scheduled to be the first ever La Liga match to take place overseas with Miami the proposed venue. However Barcelona pulled out having initially agreed to travel to the United States for the game which will now take place in Girona. It has been a busy week for Ernesto Valverde’s men. They completed the surprise signing of Kevin-Prince Boateng, who went on to start their 2-0 defeat at Sevilla in the Copa del Rey. That was followed by the addition of Frenkie de Jong for a £65 million fee although the Dutch midfielder won’t officially join the club until the summer. Barcelona have also been widely criticised for their performance and team selection in the cup with a host of key men left out including Leo Messi, who was also on the bench last weekend in La Liga. Messi didn’t even travel to Seville so should be fresh to play here, which is hardly good news for Girona. Like their more illustrious Catalan neighbours, Girona were also in cup action this week and they took the fight to Real Madrid before succumbing to a 4-2 defeat at the Bernabeu. They now face Spain’s big two in back-to-back home games that will test just how good this side is. They have been really taking the fight to La Liga’s giants in recent weeks with a remarkable 3-3 draw at the Wanda Metropolitano sealing their Copa del Rey progress. They will show no fear here and another high-scoring game looks likely. All of Girona’s last 7 games in all competitions have seen both teams score and 70% of their home league games this term have done likewise. Barca meanwhile have been more open operating with a 4-3-3 this term. They’ve allowed more than one Expected Goal in 5 of their last 6 games in all competitions and have conceded in each of their three away games so far in 2019. This Sunday’s game in La Liga sees a resurgent Athletic Bilbao take on Real Betis at San Mames. Victory for the hosts would see them put yet more distance between themselves and the relegation zone having looked in pretty serious danger a few weeks back. Betis meanwhile are hoping to keep up their push for European action. The visitors have had a busy month already and drew 1-1 at Espanyol on Thursday night in the 1st Leg of their Copa del Rey Quarter-Final. With Europa League action still to come next month, they will need to use their squad so it was a slight surprise to see Takashi Inui loaned out to Alaves this week. They have though completed the signing of highly rated Mexican teenager Diego Lainez and it’ll be interesting to see how he develops. Athletic are out of the cup but in a strange season, they would only be 3 points off Betis were they to win this and that would put them back in the frame for Europa League qualification. Results have really picked up since Gaizka Garitano took charge and they almost made it 3 straight league wins last weekend at Villarreal with Inaki Williams having a late goal ruled out for offside. Overall there are plenty of reasons to fancy the hosts here. Quique Setien has been taking the cups very seriously and you sense that will eventually have a knock-on effect in La Liga. Arguably it already has with Betis having lost 2 of their opening 3 games in 2019 in the Primera Division. Having had the week off to prepare, Athletic should be the fresher team and they are playing with real belief again. They are yet to taste defeat in La Liga since the coaching switch, taking 12 points from 6 games under Garitano to more than double their tally for the season. Defensively they’ve been much more organised with only 3 goals conceded, as many as they let in during their final game under Eduardo Berizzo away to Levante. The head-to-head is also a bad omen for Betis. They’ve lost on each of their last 5 trips to San Mames. This Sunday’s clash in San Sebastian sees Real Sociedad target a relatively rare home win against struggling Huesca. The visitors look doomed to drop out of the Primera Division with only 11 points on the board and just 18 games to play. They are already 10 points adrift of safety and even victory here is unlikely to change anything in truth. Huesca’s season hasn’t been without its memorable moments and they did start 2019 with a victory over Real Betis. However that has failed to prove to be any form of building block with defeats to nil against Leganes and Atletico Madrid since then. They’ve had their chances in many games this term but they’ve not been anywhere near clinical enough in front of goal. Sociedad meanwhile have shown signs that they are starting to enjoy life under Imanol. He is La Liga’s most recent appointment having taken the job just after Christmas and he is yet to see his team lose having played 5 times in all competitions. They were knocked out of the Copa del Rey on away goals by Betis but that may only aid their chances of pushing for Europa League qualification through the league. The new man is certainly more attack-minded than his predecessor and that largely plays to Sociedad’s strengths. They’ve scored twice or more in 4 of their 5 competitive outings under Imanol and will fancy they can extend that record here. It’s a team with plenty of attacking talent with Adnan Januzaj and Mikel Oyarzabal impressing out wide while Willian Jose has hit form again through the middle. The Sociedad striker has been linked with a Premier League move over the past year or so and does appear to have the game to suit the English top flight but his current fans will certainly be hoping he stays. He has 4 goals in his last 3 league starts. This Sunday’s action in La Liga concludes with Real Madrid’s trip to Espanyol, traditionally a happy hunting ground for Los Blancos although they did lose this fixture last term. It has been a long winter for both sides already but there have been a few possible glimmers of light for Real Madrid over the past few weeks. Los Blancos come into this on the back of 4 wins from 5 in all competitions. The only game they didn’t win was the 2nd Leg of their cup tie with Leganes which was already as good as over. That has produced a timely boost for Santi Solari, who was starting to come under increasing pressure. They left it late to deservedly see off Sevilla last weekend and are in good shape to make the Copa del Rey Semi-Finals after a 4-2 win over Girona in midweek with Sergio Ramos bagging a brace including yet another Panenka penalty. As for Espanyol, they also have a shot at reaching the last four of that competition but did concede late to only draw 1-1 at home to Betis in the 1st Leg of their Quarter-Final tie. Their league form though is pretty dreadful right now with 8 of their last 9 outings ending in defeat. They have fallen from the top four into the bottom half and could yet slip into a relegation battle if things don’t pick up soon. This game is unlikely to prove the platform for a turnaround. Real Madrid’s 2nd half performance last week was as good a 45 minutes of football as they’ve put in all season and they will travel here with confidence. There are still a few concerns about a lack of goals from their forwards but both Vinicius Junior and Karim Benzema have been playing well in terms of their all-round game and other players are chipping in with goals. Espanyol have lost 3 of their last 4 at home in La Liga having boasted a 100% record at the RCDE Stadium until that point. It has been a fairly dramatic collapse too with those 3 defeats seeing them concede 10 goals in the process and score only twice. Barcelona won 4-0 here in December and while Los Blancos may not secure such a margin. The Monday night game in La Liga this week comes from the Basque Country where high-flying Alaves take on in-form Rayo Vallecano. It promises to be an interesting game that should tell us a bit more about how the second half of the season is likely to pan out for these two clubs. Alaves have been one of the stories of the season so far. They spent much of the first half of the campaign in the top half but they’ve been hit hard by a series of blows this month. Firstly they lost Ibai Gomez to Athletic Bilbao and fellow winger Jony picked up an injury a matter of hours later. With two of their best players out, they were hammered 4-0 at Getafe on the previous match-day but despite that they remain in 5th. If they can regroup, they are still well placed to try and put together a genuine top six challenge. As for Rayo, January has been very good to them with 10 points from their last 4 games breathing new life into their fight for survival. They appeared to be on course for 4 straight wins last time out, only to squander a 2-0 lead to draw with Real Sociedad. The Basques could actually have won it late on and defensive problems remain for Rayo but they at least now have some kind of platform to build a survival push from. This is a tough one to call but the value looks to lie with the hosts. Alaves may have lost their influential wingers but they still have a defence that has conceded just 0.67 goals per home game this term and most likely just had a rare off-day last time out. They’ve had 10 days to stew over that and motivation shouldn’t be an issue here for a side that is yet to lose this term in 10 outings at the Estadio de Mendizorroza, winning over half of their league games. Rayo’s recent resurgence has largely come at home and they have lost 67% of their away league games. With the division’s 2nd worst overall defensive record and an average of just 0.56 goals scored per game away, it’s hard to seriously fancy them here against an Alaves side that has responded well to adversity since Abelardo took charge.